1. In case some of my readers aren’t sure of what we’re talking about, when we say RPG, or role-playing games, what are we talking about? What is a role-playing game? Well, when I say it, a roleplaying game is something where you and some friends get together, create characters in an imaginary world, and play out their adventures using dice (or some other randomizers) and a set of game rules to determine the outcomes, building the story (and, to a degree, the characters) as you go along. I’ve run into a lot of folks to whom “RPG” now means online games, so I guess that makes me an “old school” gamer, since to me it means tabletop, face-to-face games. 2. How old were you when you played your first role-playing game and what game was it? I was 12 and it was the first edition of Gamma World from TSR. My school friends and I quickly moved on to the D&D Basic Set and other games as well. 3. What do you feel are some of the benefits of having role-playing games as a hobby? I think there are many benefits, not the least of which are stimulating the imagination, teaching English, math, and research skills, social time with friends, and providing a fun creative outlet. 4. What would you like to say to parents who may be concerned about their child’s interest in role-playing games? Try actually playing an RPG with your child to get an understanding of what it’s like from the inside. Talk to your kids about their RPG experiences and why they’re interested in them, rather than relying on outsiders with an agenda (including me!). Get informed and form you own opinions. 5. When did you realize that perhaps you could go from a player of, to a creator of role-playing games? Wow. The first one I can recall. That’s definitely one of my more obscure projects… Back in my full-time freelance days, you took work where you could get it. 7. Now, I don’t want to ask Dad to pick a favorite, so what are a few of your role-playing publishing achievements you are most proud of? Well, Mutants & Masterminds because it’s the most robust and long-lasting game line that I’ve had the most direct hand in, as both designer and developer. In particular, Freedom City is my baby and I’ve loved watching the setting grow and develop as other creators get to play there. I’m proud of my contributions to Shadowrun and I have a deep fondness for the game and its world. I’m also quite pleased to have contributed to Earthdawn, which is probably my favorite fantasy RPG. 8. All right, you have this question to expound on the virtues of the “Mutants and Masterminds” role-playing game. Well, the goal with M&M was to create an RPG that plays like a comic book, and I think mechanics like the Toughness saving throw for damage and the acquisition and spending of hero points help to make it so. There’s a give-and-take to the action, and players are rewarded for doing things in a superheroic fashion. Plus, M&M benefits from having top-notch production values and artwork, which is a credit to our Art Director, Hal Mangold, who does an awesome job making the books look good, and to Sean Glenn, who did the initial graphic design for the “look” of M&M. 9. Okay, huge swaths of my readers adore your partner Christopher Penczak, so please take a moment to share something amusing about him. I’m all for public embarrassment, but if you prefer, it can be something nice and not humiliating. It’s funny how, in a different world, Christopher might well have been a big-time gamer: he had some experience with D&D as a kid, but the group he played with wasn’t very good, so he didn’t have much fun and gave up on the idea of RPGs. I think, if he’d played with a better group, there’s a good possibility he would have ended up as an RPG author or designer, he’s certainly got all the right talents for it! Something I’ve considered recently: how does (or did) your experience as a gamer inform your spiritual life, and vice versa? Is it true what the hysterics of the 1980s claimed: did D&D (or RPGs in general) “lead you into the occult”? What’s the overlap between the gaming hobby and the neo-pagan spiritual path, and what (if anything) does it mean? That is an interesting question. I didn’t actually start gaming until late high school, which makes me a late bloomer compared to most gamers I know. By that point, I already had a fascination with other faiths and magical practices. Perhaps because I was the only Jewish student in my school, perhaps just because? I feel gaming and various spiritualities can overlap. Anyone who has cracked open an old school GURPS source book on Greece or Egypt has been given a crash course in mythology. Dungeons and Dragons, back when there were alignments and clerics to deities, forced players to consider issues of faith and the inner struggle of good versus evil. Personally, my first game ever was Vampire Second Edition from White Wolf. Our game master never let us forget the price you pay for immortality. At its finest, gaming gives you a safe environment to explore and challenge different ideas and societal conceptions. This does serve as an entry point to consider the idea of other faiths and modes of spirituality. Obviously, this isn’t universally true. I have met gamers who to put it kindly, are narrow-minded. And of course, being of a faith outside of the norm of your community doesn’t automatically mean you’ll enjoy the hobby of gaming. Gaming, like any hobby is something that some will enjoy and some will find boring, lame, and/or a waste of time. I polled several of my gaming buddies, and this question I feel best asserts my posse’s geek cred. 11. In the “Song of Ice and Fire” RPG, will players be able to recreate fights like the one between Gregor Clegane and Prince Oberyn without using dumb tactics for either one or requiring ridiculously implausible rolls? We certainly hope so! SIFRP (as we call it for short) has a lot of optional detail for systems like combat, but one of my favorite aspects of it is how the player chooses the consequences of damage suffered by the character; all “damage” in combat builds towards “defeat,” at which point the victor gets to decide what happens to the loser: death, unconsciousness, severe embarrassment, or what have you. The defender, however, can choose to mitigate such losses by accepting injuries and wounds (long-term setbacks) to stave off defeat, or even to yield (offering up their own terms of defeat) rather than letting their opponent dictate the terms. There are a lot of options in there for making a good story out of a fight. 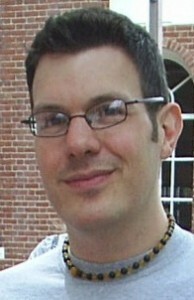 Steve Kenson began freelancing in the RPG industry in 1993. By 1995, he was working full-time as a freelance author and designer on RPGs such as Shadowrun and Earthdawn. He has written for a wide variety of game-lines and published ten novels: seven for the Shadowrun line, two for Crimson Skies, and one for MechWarrior. In 2002, Steve designed the Mutants & Masterminds Superhero RPG for Green Ronin Publishing under the Open Game License. Two years later, he became a line developer with Green Ronin, overseeing the development of the Second Edition of M&M, along with games such as Blue Rose, True20 Adventure Roleplaying, and A Song of Ice and Fire Roleplaying. He remains an avid gamer with his weekly game group. Steve maintains a website at www.stevekenson.com and a LiveJournal at xomec.livejournal.com. He lives in southern New Hampshire with New Age and pagan author Christopher Penczak and residential counselor and part-time tooth fairy Adam Sartwell. Previous postThink Before You Pink!